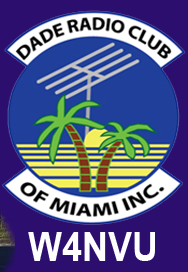 October 2018 – W4NVU – Dade Radio Club of Miami Inc.
Meeting was called to order at 19:30 with 13 present. Meet and greet was completed. Brandon presided over the meeting and welcomed everyone. Julio is working. The meeting was not broadcast live on the air tonight from the EOC. No candidates for testing tonight. Everyone took turns and stated their name and call sign. Brandon welcomed everyone again. Secretary – There were no minutes to approve from September 2018. Not enough members. Corresponding Secretary: Lloyd is Absent. Treasurer – Lee reported 2 memberships paid and brought in $70 cash. New total is $5712.91 (June Balance). Club Elmer – Miguel is not present, nothing to report. Hamulance – Merritt absent, nothing to report. HurricaneChecklist.com – Brandon reported this is a helpful resource. The 147.000 – Jason stated needs copy of new certificate insurance. No ETA. The 147.760 – Brandon reports its up and running. The 444.200 – Brandon reports this repeater was relocated. 444.400 – Dave reports repeater is working in Aventura. 443.150 – Dave reports repeater is working in Aventura. D-Star – Ryan reports the node is down; new server has been ordered. Net Manager – Brandon advised there is a new schedule. He will provide the new schedule to Ryan/W4NTR so he can post it on the w4nvu.org website. Presentation: None, PC is broken. Brandon asked if anyone had any old business. There was none. Brian got emails about events. The first email has gone out about the Miami Marathon on January 27th. Interested parties should contact Ben Nemser. Orange Bowl Parade will be December 2nd in downtown Coral Gables. Email will be sent out for volunteers this week. Armando is starting a new ham radio class. Testing session will be on October 27 at 1300-1500. Please contact Armando Flores if you are interested. Armando also stated that it is important that we elmer new contacts. A hands on session will follow inclusive of projects or help with programming. Palms West Amateur Radio Club will have an event on November 24th. Lee reports we received a donation for $5 fire cabinet. This weekend is the Melbourne Hamfest. Mike Jasinski brought up lack of repeater coverage in West-Dade. Brandon reports there are no viable locations in West-Dade due to lack of building or tower structures. Jason recommended to use 147.150; 146.925 and 444.200 (which are co-located together). With no further business, Brandon thanked everyone for coming. Brandon made a motion to adjourn, seconded by Ryan. The DRC meeting was adjourned at 20:07.